Cranbrook, BC, June 11, 2015: Tarku Resources Ltd. (TSX-V: TKU)("Tarku") is pleased to announce the commencement of a 2,100 line-kilometre airborne electromagnetic survey over its road-accessible Chateau Fort project in Quebec, located approximately 70 kilometres south of Stornoway Diamond Corporation’s Renard Mine. The survey is being flown by Prospectair Geosurveys (Prospectair) using the ProspecTEM time-domain electromagnetic system. EM surveys are an effective method of identifying targets with the potential to host gold-bearing sulphide-rich rocks noted elsewhere in the region. The survey is expected to take approximately 1 week, weather permitting, to complete based on an anticipated rate of 300 line-km per day. Survey lines will be flown at a 100 metre spacing. Anomalies generated from the survey will be targeted for follow-up later this summer. Chateau Fort adjoins the “167” property currently being drilled by Visible Gold Mines Inc. (VGD-TSX.V)(VGD). In late 2014, Visible Gold announced the discovery of high-grade Au-Cu-Ag boulders at Km 147 and Km 150 along the newly constructed Route 167 Extension, a 4-season road providing direct access to the region. The property is also along strike and directly adjacent to the past-producing Eastmain Mine of Eastmain’s Ruby Hill project and directly south of their Lac Lessard Property. Eastmain plans work programs, including drilling, of $1 million and $500k respectively on those properties (PR- eastmain.com; January 27, 2015). The Chateau Fort property is 18,867 hectares in size and includes Au, Ag, Cu, Zn and As anomalies identified by Anthem Resources Inc. (AYN-TSX.V)(Anthem) geochemical surveys (lake bottom, soil and stream sediments). Compilation work has identified nine high-priority gold targets for follow-up. The current airborne EM survey and follow-up ground work later in the year will be used in conjunction with existing data to identify potential drill targets. Tarku is earning a 100% interest at Chateau Fort from Anthem (see press release TKU-PR March 24, 2015). 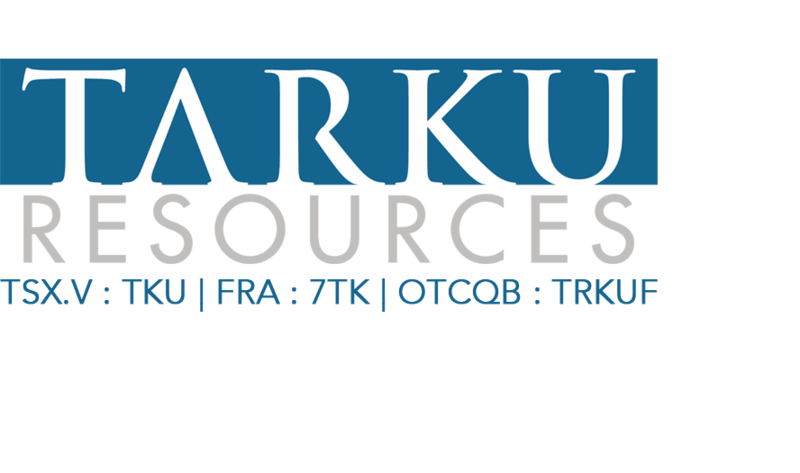 Visible Gold has reported assays of up to 63.83 g.t Au, 62.6 g/t Ag, 2.63% Cu and 4.62% Zn in 11 boulders at Km 150 (PR- visiblegoldmines.com; November 11, 2014, and up to 142.5 g/t Au, 22.2 g/t Ag and 0.61% Cu in boulders at Km 147 (PR- visiblegoldmines.com; November 4, 2014). Mineralized boulders are reported to be angular and magnetic with “alteration minerals and semi-massive to massive sulphides”. The rocks have the appearance of banded mafic/felsic volcanics with sulphides and quartz layers, based on photos on the VGD website. It is likely that they are sourced from the NNE, based on the regional ice direction indicators.